Boy Wander: My BigSkinny Wallet: Best Wallet Ever! I've never been happier with my Christmas gift to myself this year: a BigSkinny wallet. BigSkinny is the world's thinnest wallet. It's 10 times thinner than leather due to its nylon-microfiber material, which reduces wallet sizes by more than half. I came across this on Facebook months ago because I always got hit by their ads. I got curious but at the time, I thought the logo looked cheap on their wallets. Last week, I finally went online and ordered myself the RFID-blocking wallet. Aside from being skinny, it prevents others from scanning personal info from cards. This cost P3,100 (including a P50 discount for signing up and delivery charge). I noticed that this was the most expensive one, probably due to the RFID-blocking properties. To my surprise, it came the next day--and it's really light and skinny! My wallet has always been bulky. In fact, it wouldn't even fold properly because of all my cards and receipts. 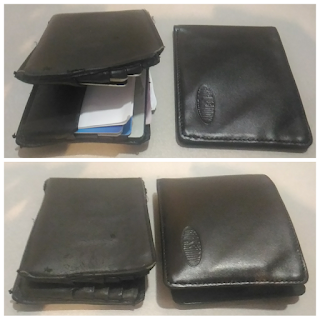 With the BigSkinny full of the same stuff, it's now the same size as my old wallet--but empty! If you look at my BigSkinny now, you wouldn't think that it's a special wallet nor does it look skinny but just imagine all the stuff in there. It's definitely worth every cent. Best wallet ever.